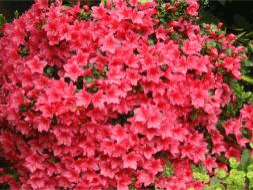 There are more than 10,000 different varieties of Azaleas that have been named so there is wide selection of sizes, flower colors, and bloom times to choose from, and they can be either deciduous or evergreen. Azaleas don't like getting their feet wet so you should provide good drainage by planting them with the tops of their root balls a few inches above the ground level and then mound soil up to the plants. Their water requirements are dependent on soil types, temperatures, winds and sunlight. The root system should be kept moist. To avoid cutting off next year's flower buds, major pruning should be carried out soon after they bloom, and whilst established shrubs generally do not require any additional fertilizer they need to be kept well mulched. The humus from the rotting mulch will provide sufficient nutrients. However, should you choose to use fertilizer, it is advisable to apply it between late fall and early spring when the plants are dormant. It's best to avoid fertilizing after June, to keep from forcing plants into active growth ahead of the wintertime as late growth is vunerable to frost damage. Soil acidity (pH)s should be in the range of 4.5 and 6.0 for best results. These colorful shrubs can be employed in many different ways in landscapes. They can be used as specimen plants or focal points, foundation planting, hedges, screens, and container plants. Additionally they can be placed in borders and beds, along paths and driveways.They have a great deal versatility due to their varied characteristics of plant size, flower colors and bloom times. Rhododendron Bollywood Azalea 'Farrow', provides an impressive show of elegant color and is a real show stopper in any landscape, flowering from early spring to early summer. 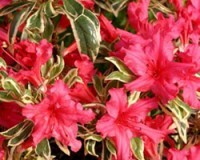 The bright, deep pink flowers appear in the spring and the foliage is glossy, silver and dark green variegated. It is a hardy, compact, semi-evergreen that provides season-long color and attracts many butterflies. Good drainage is essential for this plant; water regularly, especially when newly planted. It needs little pruning, but may be trimmed after flowering. It is advisable to apply a controlled release fertilizer in early springtime. It's also wise to have some shade in sunnier locations and some protection in colder climates. With a mature height of 18-24 incches and spread of 24 - 30 inches it makes a stunning display when used in mixed borders, as an accent plant, or in containers. With it's wonderful deep pink color and style it will certainly brighten up your garden. This variety is a compact evergreen with brilliant flowers. It has large colored fiery orange-red to scarlet blooms and beautiful foliage in the fall. Their medium size growth is sufficient to make them adaptable to the south as well as in the colder climates. The Hot Shot Girard is an ideal size for shrub borders, foundation planting, and low screening or hedges. 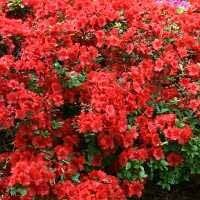 These Azaleas need minimal pruning. After bloom simply clip ungainly branches to conform to the plant's natural mounding habit. An upright variety growing to a mature height and spread of 24 to 30 inches that prefers partial sun to partial shade.